Ash Vale Flood Forum | Joining In! Ash has formed a local dementia action alliance to support people living with and affected by dementia with the aim of creating a dementia-friendly community that is inclusive and accessible to all. 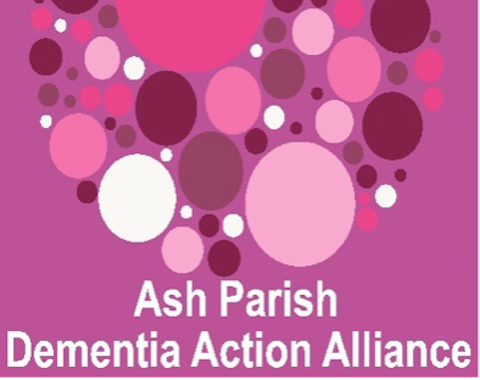 Ash Parish Dementia Action Alliance (APDAA) is made up of local residents, including people living with and affected by dementia and partner agencies. All of whom are passionate and committed to actively contribute towards improving the lives of people living with dementia, their family, carers and friends within the local community. With funding from Guildford Borough Council’s Project Aspire, APDAA is holding a series of accessible events during Dementia Awareness Week, May 14 to 19. 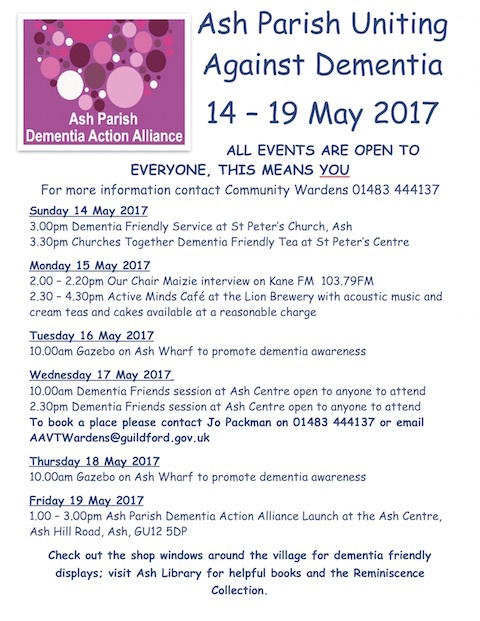 Events include a dementia friendly service at St Peter’s Church; Active Minds, a dementia friendly music and tea event at the Lion Brewery pub; an information gazebo on the Wharf; dementia friendly books and items at Ash Library; and keep active and fit taster sessions. The week will close with the official launch of the APDAA, giving people the opportunity to access information from other agencies and speak to members of the APDAA. Local shops are supporting the launch week by featuring dementia friendly themes with many of them participating in the dementia friends awareness sessions. Those that have completed a session will be wearing a Forget Me Not badge. Local businesses that sign up to APDAA will display a sticker in their shop window to show people living with dementia and their carers that they are committed to developing a dementia friendly business. According to the Alzheimer’s Society website, within Surrey it is estimated that there are more than 16,000 people living with dementia, many of whom are at risk of becoming socially isolated within the local communities. There are 850,000 people with dementia in the UK. In 2017 225,000 people will develop dementia. Numbers set to rise to over one million by 2025. This will soar to two2 million by 2051. one in six people over the age of 80 have dementia. More than 40,000 people under the age 65 are living with dementia in the UK. 70% of people in care homes have dementia or severe memory problems. More than 25,000 people from black, Asian and minority ethnic groups in the UK are affected. 2017 marks the seventh year that Guildford Borough Council’s Playrangers will be celebrating Love Outdoor Play Week, in association with Re:Play, the play association of the South East of England. This special week focuses on highlighting the play opportunities on offer in the fantastic green spaces across the South East. It is an annual celebration with events organised all over the region to help children and young people get out and play; encouraging and promoting outdoor play, whatever the weather. Reminding play workers, community workers and families alike that outdoor play is not just for the summer. to provide opportunities for children of all abilities and backgrounds to play together in their communities. Each session runs daily after school, from 3.30pm to 5.30pm. There will be a variety of playful, creative and sporty activities available daily on the theme of ‘Giant Games’; such as giant art, giant, smores, giant table football, giant bubbles – all in all there will be a giant amount of fun! The latest edition of the Joining In! booklet for Westborough and Park Barn is now published, containing details of things to do and how to get more involved in your community. Once again, groups and organisations are listed with what they have to offer. There’s something of all interest for all ages! Free copies have already been distributed to schools and churches. The forum has committee meetings to ensure that the issue is discussed regularly. Local councillors and representatives from Guildford Borough Council, Surrey County Council and the Environment Agency, together with local residents affected by flooding, can meet the committee to gather more detailed information, and work to help provide solutions.